A good friend of mine from way back in high school got married on Long Island this weekend (Congrats Aaron and Mel) and to get to the wedding and reception and to run some errands Friday night Daisy and I decided to rent a car. The deal we got was so good we decided to keep the car for the whole weekend, and because Daisy had longstanding plans to spend time with some friends of hers, on Sunday I was left at loose ends and with access to an automobile. Because I had not had a lifer since a Sandwich Tern in July I decided that getting a lifer would be my goal. I had a couple birds from which to choose. A Fork-tailed Flycatcher had been showing nicely on Cape Cod for several days but when I mapped out the drive I realized that it would be five hours each way which is way more time than I wanted to spend in the car. The Roseate Spoonbill at the Brigantine Division of the Edward B. Forsythe National Wildlife Refuge in New Jersey, which has been seen off and on for months sounded tempting. It would be a lifer, it was only two-and-a-half hours away, and I had only birded Brigantine once before when I had just started birding and didn’t know what I was doing. When the bird was reported on both Friday and Saturday my mind was made up and Sunday morning found me desperately trying to see a Roseate Spoonbill in fog so thick that I wanted to cry. My first trip around the refuge’s eight-mile auto loop took me four hours and netted me exactly zero Roseate Spoonbills, though I did see a ton of other great birds. Back at the refuge headquarters I looked through the sightings book and saw that someone had reported the spoonbill that very morning! It was out there and I had somehow managed to miss it. I had been planning on doing the loop again anyway in the three hours I had left but now I had hope, because the bird had been seen, and motivation, because there was no way I was going to drive two-and-a-half hours each way and not see an obvious bird that others managed to see. A momentary pause might make sense here to explain what, exactly, a Roseate Spoonbill is and why I so wanted to see one. First of all, the roseate part of the name is much more accurate for this bird than for, say, a Roseate Tern. 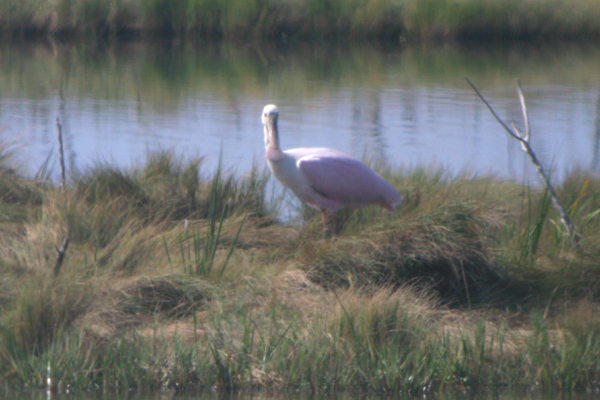 Though Pink Spoonbill might be a more apt moniker. And pink birds are always cool! The spoonbill part of the name is because the bird’s bill has a spoon-shape at the end which it uses to swish through the water and snag invertebrates and other goodies. So we are talking about a pink bird with an awesome-looking bill that is as big as a medium-sized heron and, in this case, is hundreds of miles from where it should be! And have I mentioned that I had never seen one? And also that I had, apparently, managed to drive right past a three foot tall pink bird without noticing it?!? Fortunately for me the sun had come out and a Northern Harrier was patrolling the marsh on my second time around the loop. As the harrier flew past a small, marshy island it was putting up Great and Snowy Egrets. All of that movement naturally caught my eye as I puttered along in the rental car searching desperately for the spoonbill. Then a pink mass of feathers rose up from in front of the harrier’s path and dropped back down behind the island after the harrier passed. Unless a flamingo had snuck into Brigantine without anyone noticing, which seemed highly unlikely, I had spotted the bird. But now it was behind an island and out of view quite some distance away from me. As I waited for the bird to show itself again I started having second thoughts. Maybe what I thought was pink was actually the sun hitting the orange underside of the female harrier? Maybe I had inhaled too much marsh gas and had hallucinated the pink bird? Then, finally, out stepped my life Roseate Spoonbill! I recognize that the pictures are a wee bit underwhelming but, trust me, the bird was much more impressive in person. The picture’s quality has more to do with the range I was shooting from, as can be seen in the picture below. I watched the Roseate Spoonbill for nearly an hour before I needed to get moving and I must say I enjoyed every second of it. Lots of other birders were at Brigantine and hearing their exclamations when they stopped for a look was wonderful. Everyone likes big, pink birds! It was also cool to watch the Snowy Egrets follow the spoonbill, I think hoping to grab stuff that the spoonbill stirred up by swishing that cool bill through the water. Sometimes the spoonbill took exception and charged an egret! Oh, I pity you, you poor soul. My next post will start with “Because I had not had a lifer since a Bewick’s Wren in July 2007…” and no, I don’t expect any sympathy from you! You are spoiled, hear me? Hopelessly spoiled! But apart from that: nice lifer, Corey, very nice bird indeed! and deserved as well. Yes, second time around is indeed the charm with this bird! So glad you got it. I’ll never forget seeing my first Spoonbill. It was in Florida, but in southeast Broward County, an area of Florida where they do not tend to hang out, and in Anna Kolb Nature Center park, which is also known locally as “the park with no birds”. I walked the boardwalk thinking I might see Anhingas at the end, and instead…one lovely Roseate Spoonbill, just me and him. Just goes to show that you never know what you will find where. I’m glad you caught up with the Spoonbill. It took me three tries (in three separate months) to see it. The bird is really awesome. When I saw it, I first spotted it a long way away, but then it took off and flew directly overhead. I can’t imagine a better view. Now I feel like I sort of cheated, getting my life Spoonbill in a roadside ditch in the Inimitable Todd’s parent’s subdivision. Great bird, and a great story to go with it. Congrats! Ah, well, I went for the spoonbill with some friends a couple of weeks ago and missed it, then ran into another set of friends further around the dike who had seen it. We considered driving back around to try again, but wound up wandering westward for roadside Jerseyana instead. We saw the previous Brig spoonbill a few years ago, at least.